But China for all its size has made itself a limited nuclear power. It has demonstrated its ability to build very big bombs but chose to test and make few of them. The size of China’s arsenal is a highly guarded state secret, but estimates put it in the several hundreds, not thousands. Beijing can hold armies and cities at risk, but not make the rubble bounce several times over. During the palmy days of the 1950s, the Union of Soviet Socialist Republics shared technical, industrial and military knowledge and material with its new communist sibling. However, by the early 1960s the relationship was on the rocks, inflamed in part by Soviet alarm at Mao’s erratic behavior and Chinese irritation over the USSR’s support of India. Without Moscow’s promised bomb prototype and fissionable material the Chinese had to do it themselves. The first Chinese nuclear device, code-named „596“ for „June 1959“ when it began, was like the Soviet Union’s and Britain’s first bombs, in that it was a close copy of the „Fat Man“ implosion bomb dropped on Nagasaki. Its yield – 22 kilotons – also closely matched the others but its fuel was pure Uranium-235 rather than plutonium. The CIA knew of China’s upcoming test from its new Corona spy satellites and the State Department sought to reduce the impact of the test by announcing it in advance. Nonetheless the advent of China as the world’s fifth nuclear power caused an uproar. Taiwan wanted U.S. backing for either a preemptive strike or its own nukes. (Neither came.) U.S. analysts had missed China’s U-235 production and wondered what else they’d missed. Diplomats began exploring non-proliferation talks with the Soviets. But doubts still floated about China’s nuclear status. Sure, they now had the bomb, but could they fight with it? Mao was determined to prove it. On May 14, 1965, less than six months after the first test a PLAAF H-6 bomber dropped a fully-weaponized version of the 596 at the Lop Nur Test Site in Xinjiang. The third test a year later in 1966 tested the first „boosted“ design fortified with Lithium-6 fusion fuel. It yielded an impressive 250 kilotons. But China still got the „Rodney Dangerfield“ treatment from foreign defense thinkers. So on October 27, 1966 a DF-2 intermediate-range ballistic missile flew 550 miles over populated parts of China to Lop Nur where its 12-kiloton warhead detonated 180 feet over the Gobi Desert. It was the second all-up nuclear missile test ever conducted after the U.S. Frigate Bird test of 1962, and it quieted doubts about China’s nukes. Even as the Cultural Revolution began roiling China the nuclear tests continued; a month after the missile test a 300-kiloton boosted-fission explosion showcased their design of a hydrogen bomb. Six months later on June 17, 1967, only two and a half years after its first nuclear test, China tested an air-deliverable thermonuclear weapon. The three-stage device used a fission primary (an A-bomb) to heat and compress a second stage of lithium-6 deuteride powder. A third stage was a heavy shell of uranium-238, which held the explosion together for just long enough for the hydrogen in the lithium compound to undergo nuclear fusion. The resulting burst of neutrons caused the U-238 shell to fission and explode. The bomb yielded 3.3 megatons – big by any measure, big enough to destroy Tokyo or Los Angeles or Moscow. China ran the race to the H-bomb faster than any nation before or since that we know of. In 1967, China’s attempt at using plutonium in a bomb fizzled, but it was successful in another test in December of 1968. This 3.0 megaton shot, and others with yields of 3-3.4 megatons, were also tested in 1969, 1972 and 1973. In addition, all of these tests were for fitting a large warhead on the DF-3 ICBM. They represent all but the largest Chinese tests. After all of this work, China conducted its biggest test, a 4.0 megaton blast, in November 1976. That test proved the capability of the DF-5 ICBM’s warhead. The US has never come to terms with Iran’s new political order that emerged after the 1979 revolution, which brought down the Shah and his regime. The Shah of Iran was a compliant ruler who fitted well into the US’ strategy in the Middle East. The clerical regime that followed was anything but. There were fears that it would destabilise the region, shared by the US’ friends and allies in the region. And those fears have been resurrected, with President Trump dumping the 2015 nuclear deal with Iran designed to curb its nuclear programme. We will come to this later but, first, to sketch out a bit of history after the 1979 Iranian revolution. Among the US friends, at the time, was Saddam Hussein in Iraq, who had a long-standing maritime boundary dispute with Iran, and was keen to settle scores with the new regime before it had time to settle down. The US encouraged him on this course and provided him with military aid to take on Iran. Thus started the Iraq-Iran war in 1980 that lasted eight years, with Iran bearing the brunt of heavy casualties. Iraq was drained out economically, with the country owing debts it had incurred from fellow Arab countries to prosecute the war, which they had encouraged. And they seemed in no mood to write off these debts. Saddam sought to sort out his political and economic problems by invading Kuwait, keen to annex it with its oil riches. The adventure was foiled by the US-led military action that left Saddam choking, with international sanctions choking Iraq. And when the 9/11 terrorist attacks hit the US, it was followed by the US-led invasion of Afghanistan because of its link with the al-Qaeda leader, Osama bin-Laden, based there and sheltered by its Taliban regime. The US then had George W Bush as its president and the new regime set out to reset Middle Eastern affairs, starting with getting rid of Saddam Hussein’s regime as it was regarded as unfinished business from the time of Bush senior. And they started creating narratives about Saddam’s al-Qaeda links and his weapons of mass destruction, which were found to be non-existent. Saddam was overthrown and hanged, followed by an unstable and chaotic Iraq, which to this day is in a state of perpetual disorder, bordering on anarchy. The resultant sectarian strife led to the emergence of IS, which, though seemingly beaten now in Iraq and Syria, exists as a powerful ideology wreaking havoc inside and outside Iraq. The majority Shia rule in Iraq, though with deep divisions, gave Iran considerable political influence in Iraq. Some of its prominent leaders were living in exile in Iran during Saddam’s rule. The US invasion and occupation of Iraq had made Iran terribly nervous. However, as the US occupation landed it in a quagmire, Iran was less vulnerable and had more influence with the new Shia political order in Iraq. At the same time, Iran had started to work with nuclear technology, including enrichment of uranium, which would enable it, at some point of time, to develop an atomic bomb, if it so desired. And this program was reaching an advanced stage. There were two ways to deal with it. First was to attack and destroy Iran’s nuclear facilities, though it wasn’t that easy because, unlike Saddam Hussein’s research reactor that Israel was able to destroy earlier, the Iranian facilities were less exposed to such instant hits by enemy bombers. Therefore, there was greater risk of things getting out of control. Israel still favoured this option, provided it had the US backing and protective cover. The US, under Obama, was not convinced. Obama wanted greater flexibility in the US’ Middle Eastern policy, and permanently ostracising Iran with its growing nuclear capability, was no way to go about it; especially when Iran was willing to rewind its nuclear programme. The Israeli alternative of attacking Iran’s fairly secure nuclear facilities, with unpredictable and disastrous results for the region, didn’t seem like a sensible course. Obama, therefore, opted for sanity over petulance and Trump’s instinctive sense that he would be right. Going by the US intelligence and International Atomic Energy Agency inspection reports, Iran has held its part of the 2015 nuclear deal to wind back much of its nuclear programme. If the agreement hadn’t been in place, Iran would have been close to, if not actually, developing a nuclear weapon, if it had chosen to do so. Writing in the New York Review of Books, Steven Simon says that, “Between 2006, when nuclear-related sanctions were first put in place, and 2013, when the interim deal freezing Iran’s capability was agreed on, the number of centrifuges increased from few, if any, to nearly 20,000…. Given that Iran was installing about 3,000 centrifuges per year while under intensive sanctions, had there not been the agreement, Iran would now have yet another 15,000 centrifuges.” In other words, the agreement was doing its job. Why is Trump then scrapping it? Trump thinks that Iran is not following its spirit. It is continuing its missiles programme (not covered by the agreement), stoking trouble regionally In Syria, Lebanon, Iraq, Yemen, and refusing to come to terms with Israel’s existence and supporting the Palestinian cause. Last, but not least, Trump is committed to overturning whatever Barack Obama did – a personal crusade Trump has carried out against Obama while the latter was in the White House and now continuing. Iran, of course, is threatening to restart its nuclear programme if the nuclear deal is scrapped. But it is hoping that other signatories to the 2015 agreement, which include the UK, France, Germany, China and Russia, might be able to salvage it. It would be difficult because the US’ sanctions regime against Iran would also apply to European and other countries doing business with Iran. What does the US hope to achieve? Well, Trump wants a subservient Iran that will do its bidding, like in the days of the Shah. And it is hoped that crippling sanctions against Iran would create popular unrest leading to the overthrow of its clerical regime, replacing it with a responsive (to the US) political order enabling it to restructure Middle Eastern geopolitical atlas. The problem, though, is that, in the process, he might create more havoc in a region that is already aflame. How did the Antichrist become a statesman? Shiite cleric and leader Moqtada al-Sadr has fashioned himself as a reformer and nationalist poised to lead Iraq. Moqtada al-Sadr has been Iraq’s most recognizable villain since 2003, when he burst onto the scene as the most potent challenger to the US military occupation of Iraq. His rivals painted Sadr as a thug and an amateur, a wannabe who was lucky enough to be a member of a vaunted clerical dynasty yet nevertheless struggled to hold onto its followers. A surprising thing has happened in the years since. After a series of violent clashes and reversals, Sadr has refashioned himself as Iraq’s premier nationalist statesman. Despite a very recent historical reputation as a corrupt sectarian warlord, Sadr today has emerged as Iraq’s standard bearer for secularism and reform. Running on an anti-corruption platform, he edged out all others to finish first in Iraq’s national elections earlier this month. The United States, who had such trouble with Sadr from 2003 to 2008, might be expected to flinch at his embrace of the Iraqi Communist Party, and his growing political influence. Remarkably, though, US officials have stayed quiet about pivotal role Sadr now plays. His steady expansion of power over 15 years is a sign of the importance of charisma, staying power and, most importantly, improvisation in a volatile and sharply divided region. Sadr’s case illustrates how a leader benefits from being a known quantity personally, while at the same time bending and shifting his ideology and political to accommodate the political winds. A decade ago, the young Shiite cleric was fulminating against the Americans and the Iraqi “puppets” they had installed in Baghdad. He often wore a white shroud symbolizing martyrdom as he delivered thunderous Friday sermons. His Shiite militant followers were known for nighttime murders of Sunnis. He set out purist dictates against Western-style hedonism, prompting attacks against gays and liquor stores. Today, he welcomes not just the communists but also the same secular Iraqis his organization used to target. Sadr’s communications team tweets out his latest edicts, which are more likely to contain anodyne pronouncements about political coalition building rather than fire-and-brimstone warnings against American meddling. He solidified his power in the years after the US invasion through his fearsome Mahdi Army militia, and through jobs and spoils he acquired through the control of key government positions, including the lucrative health ministry. Yet during the recent election campaign, he vowed to overturn Iraq’s spoils system, which allows sectarian movements to carve out fiefdoms and pillage the state’s coffers. When seeking to predict events in a country such as Iraq, policy experts in the United States and elsewhere routinely focus on deep-seated rifts around ethnicity, ideology, and religious doctrine. What’s easy to underestimate is the role of a troubled nation’s day-to-day domestic political environment — and the skill with which some key leaders navigate it. Iraq’s domestic politics remain deadlier than those of most other countries, but the system there, as in so many places, rewards politicians who can read the crowd, who channel its frustration with self-dealing elites, and who avoid getting boxed in by their own past. Sadr is now the single most powerful leader in Iraq, and he brings a more clear platform and set of ambitious national goals to the table than any other political leader. As kingmaker in the complex negotiations to form the next government, he is now in a position to set the government’s agenda with his unlikely — but politically savvy — platform of reform and secular nationalism. An Iraqi man works on a poster of Shiite cleric Moqtada al-Sadr at a printing shop in Sadr City, a suburb of Baghdad. How did Sadr, a militant Shiite cleric once feared as a cat’s paw for Iran, end up as an ornery critic of Iranian influence and as the embodiment of Iraqi nationalism? Sadr’s father and uncle were revered grand ayatollahs whose teachings guided the behavior of millions of followers and inspired a generation of Shiite Islamist activists. His father was murdered by Saddam Hussein in 1999, and his fourth son, Moqtada, was considered too young and inexperienced to pose a threat. His Iraqi critics dismissed him as “Ayatollah Atari” — a reference to his love of video games and supposed lack of intellect. He turned 30 the same year that the United States toppled Saddam and occupied Iraq. Within days of the invasion, Sadr had mobilized legions of followers. The one rival who could have challenged Sadr for leadership of Iraq’s Shiite poor and dispossessed was Abdel Majid al Khoei, an older and far more senior cleric who had fled into exile in London after helping lead an uprising against Saddam Hussein in 1991. Al Khoei returned to Iraq in April 2003, with the blessing of Western troops, and set up operations in Najaf. Within weeks, he was murdered by a frenzied mob. His family, along with US officials, say that the killing was not spontaneous, but was carefully orchestrated by Sadr. Sadr denied the accusation and no one has ever been charged for Al Khoei’s killing. Sadr quickly established himself as an uncontainable force in Iraq. Almost the entire Shiite establishment cooperated with the US occupation, viewing it as the quickest route to an electoral democracy that would bring power to the Shiite majority. The leading clerics in Najaf endorsed elections under America’s auspices. Opposition militias opened political offices and worked with the occupation authority. Only Moqtada al-Sadr confronted the Americans from the beginning. He led demonstrations and recruited a militia. The Americans considered him dangerous and mercurial. Some Iraqis considered him a spoiler, creating unnecessary risks and detours along a sure path to electoral democracy. Within a year of Saddam’s ouster, Sadr’s Mahdi Army was fighting an armed rebellion against the American military in central Iraq and the British in the south. Tellingly, Sadr already then couched his rebellion in nationalist terms. He sent reinforcements to the Sunni insurgency in Fallujah, in an effort to craft a trans-sectarian front. In the seven years that followed, Sadr’s militia starred in some of the worst episodes of violence. They led the charge in the sectarian bloodletting that climaxed in 2006. They declared war against the central government in Baghdad, and were crushed. His political wing won a sizeable bloc in parliament and ran the health sector, winning a reputation for graft, corruption, and poor service. Sadr retreated into exile in Iran from 2008 to 2011, where he studied with a senior cleric to try to raise his status. He shuttered his militia, and kept a low profile. By the time he returned, the United States was pulling out its last combat troops from Iraq, and Sadr began his turn toward nationalism and reform. Unlike other Iraqi leaders, his core following remained devoted to him personally, so he could count on consistent populist support, and votes. And Sadr displayed a willingness to adapt and change. He disavowed the extremist sectarians from his movement, many of whom left to form other militias and parties. He also heaped criticism on Iran for its meddling and mismanagement of Iraq’s interests. He fired and publicly lambasted some of the politicians in his movement who had been found guilty of corruption. And when the Islamic State surged through Iraq, he reestablished his militia (now called the Saraya Salam, or “Peace Brigades”), and joined the ultimately successful struggle to reimpose Baghdad’s authority across the country. By 2015, A gray-haired and more muted Sadr had carved out a niche for himself as an anti-sectarian Shiite committed to a functional Iraqi state. That summer, protests broke out across Iraq against the government’s epic failures to provide security, jobs and even basic services like electricity. Sadr shrewdly reached out to the communists and secular reform activists leading the protests. He sent emissaries to Sunnis who felt disenfranchised from the state. Out of those early meetings an enduring alliance took shape. He took aboard the suggestions of the seasoned reform activists, and decided that what Iraq needed most of all was fresh faces: qualified, independent professionals who could run its eroding government. The housecleaning began inside his own movement. Sadr stunned his parliamentary delegation, telling them he wouldn’t allow any of them to stand for reelection. His successful slate of candidates this year consisted entirely of “technocrats,” people with managerial experience but not any disqualifying political history. Some of Sadr’s own lieutenants questioned the move, arguing that political connections and party backing are crucial for getting things done in Iraq’s fractious and corrupt government, but Sadr was adamant. He visited Saudi Arabia and endorsed warmer relations between Baghdad and Riyadh, vowing to balance Iraq’s position among the foreign powers with a hand in its politics and security. There’s a certain Nixon-goes-to-China element to Sadr’s turn to secularism. Only a seasoned militant with impeccable sectarian credentials can make a turn toward pluralistic nationalism. His positions today are all the more plausible because nationalism has been a consistent thread in all his ventures since 2003 — and because he remains a secretive, illiberal leader with untrammeled authority within his own movement. His millions of followers bring him almost exactly the same number of votes during every election. His consistent promise is to seek more jobs and a bigger share of Iraq’s economic pie. Naturally, there’s plenty of reason not to trust the cleric’s transformation. Sadr is a savvy operator, a seasoned opportunist who has shifted position over and over. He might do so again. And his alliance with the secular reformers and the Iraqi Communist Party could collapse if the next Iraqi government is formed with Sadr’s reformist blessing but still is unable to deliver better results than its predecessors. In his new incarnation as an aging statesman, Sadr hasn’t shifted all that much. His followers have stopped the vigilante attacks against gays and liquor stores, but they haven’t endorsed social freedoms and rights, either. In private, diplomats say they don’t expect Sadr to act as a provocateur. His rhetoric can be heated, but he’s a pragmatic politician who regularly meets with Western ambassadors. Despite his clerical background, Sadr’s goals line up with a strange array of otherwise unlikely allies: secular Iraqi reformists, liberals, Sunnis, militants who want to integrate into the Iraqi state, even some Western governments. Sadr wants a strong government in Baghdad, which makes room for Iraqis of every sectarian, ethnic and political stripe. He also argues that Iraq’s top political jobs cannot be distributed on a sectarian basis, as in Lebanon. Since 2003, there hasn’t been any parliamentary opposition in any of Iraq’s governments — every single party that has won votes has preferred a position in government so it can extract its share of corruption. The test for every reformist movement is what happens when it gains significant control over the state. Fulminating against the corruption of past leaders is easy; it’s far harder to resist the temptation to take advantage when your side is in power. Iraq’s system is so deeply distorted that only a strong jolt can change it. Sadr benefits from longevity, low expectations, and the lack of any more attractive alternative. But sometimes that’s enough. The US Geological Service recorded the tremor Friday afternoon. 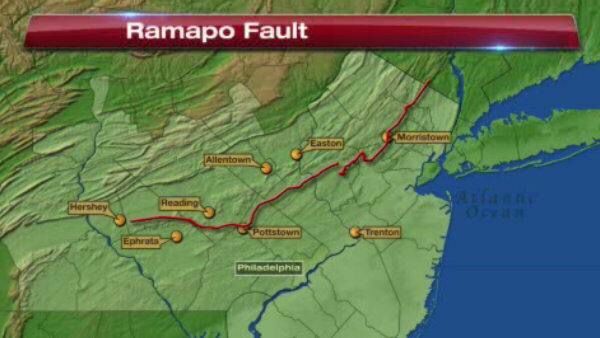 NANUET, NY — The United States Geological Survey reports an earthquake occurred Friday one mile southwest of Nanuet. The quake took place at 3:22 p.m. 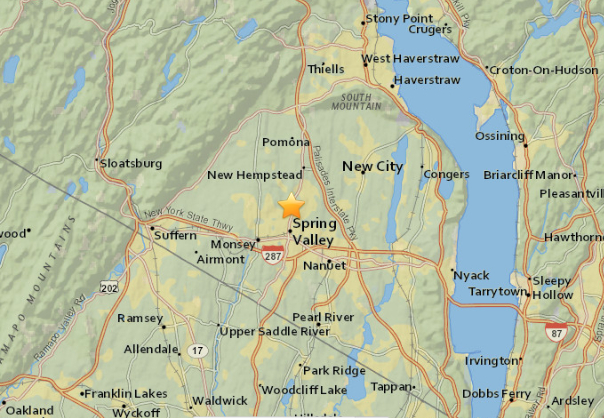 The quake wasn’t far from the Lamont Doherty Earth Observatory, which reported it. It was a magnitude 1.8, and it was 5 kilometers below the surface.